Will Mahesh Babu be the voice of @BeingSalmanKhan voice in the Tamil version of Prem Ratan Dhan Payo? A number of Bollywood films are being dubbed into south Indian languages of late. Salman Khan's Prem Ratan Dhan Payo will join the likes of Happy New Year, Bang Bang and Don 2 - all of which have been dubbed in Tamil and Telugu. The Sooraj Barjatya directorial will be dubbed into Tamil and Telugu and the versions will be released simultaneously on 12 November. Renowned Telugu actor Ram Charan will be Salman Khan's voice in the Telugu version of the film. 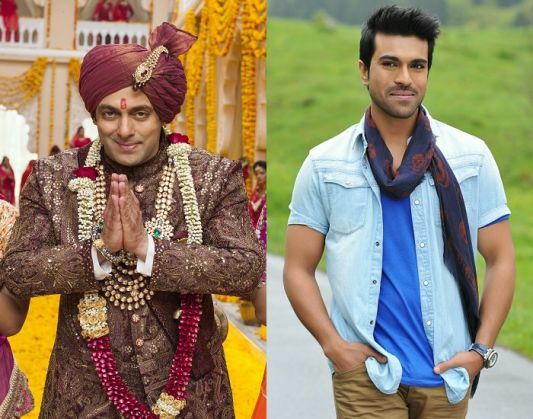 According to a report by Deccan Chronicle, Salman Khan personally requested Charan to sign on for the film. The Telugu actor is expected to start dubbing for the film from 20 October at a dubbing studio in Hyderabad. Mahesh Babu's name has been making the rounds for the Tamil version of the film. However, this has not yet been confirmed. The decision to release the film in different languages has been taken with aim to mimic the impressive response that Salman Khan-Sooraj Barjatya films seem to enjoy at the box office. Maine Pyaar Kia had a great run at the regional box office for over a year. The Telugu dubbed version of Hum Aapke Hai Koun too was received well. Prem Ratan Dhan Payo is slated to release on 12 November.